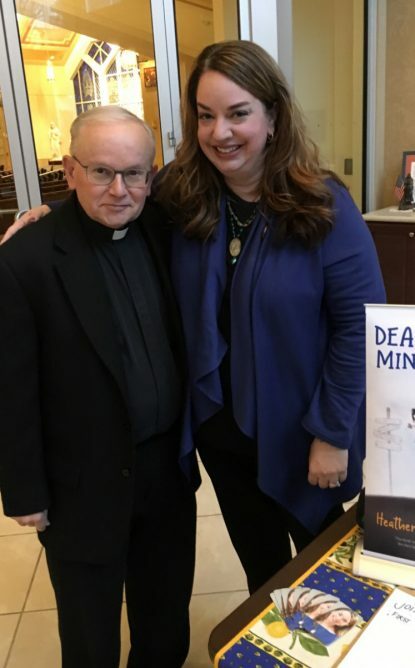 Catholic author and speaker Heather Anderson Renshaw meets with Msgr. Ralph Chieffo, pastor of St. Mary Magdalene Parish in Media, before her talk at the church March 25. When Heather Anderson Renshaw began rapping about her life as a minivan-driving momma to five rambunctious kids, the crowd of over 120 women at St. Mary Magdalene Church in Media began to roar with laughter. Renshaw, a Catholic author and speaker, is just like all moms who struggle with juggling the many demands of daily life. She recently published her book “Death by Minivan” and periodically travels around the country speaking about motherhood, marriage and living out the Catholic faith in what can be a difficult world. Her talk on March 25, the solemnity of the Annunciation, was hosted by mothers’ groups from three Delaware County parishes: St. Pius X in Broomall; St. Joseph in Aston and St. Mary Magdalen. Women traveled from across the region and as far away as New Jersey for the event. Dana Westby, a long-time parishioner of St. Mary Magdalen who also coordinates the mom’s group at St. Joseph’s in Aston, co-hosted this event. She is passionate about gathering women together to share their faith. Westby said she is grateful for the women in her life who have been by her side throughout the various challenges she has faced, and now she wants to share this with other women. She handed out flyers to women in the crowd to consider joining an area moms’ group. The title of Renshaw’s talk was “Happy, happy, joy, joy: When the rubber hits the road.” Renshaw told the women that she knows how challenging it can be to experience joy in the midst of daily suffering or difficulties, but if we begin to clothe ourselves in joy, we radiate love to those around us. She talked about Mary’s fiat or yes to the Lord and how we can say yes in the midst of our own trials. “We have to think with the eyes of God because he will use everything for our good,” Renshaw said. Once she found herself saying yes to God over and over again, she knew her life would never be the same. After getting married and having five children she knew that the only way she could live her life would be with God at the wheel. Now Renshaw is called to share the joy of Christ with the women that she meets throughout the country. She wants women to see their worth and to know that no matter what happens, joy comes from knowing who God is and who you are. She gave everyone practical tips on how to keep joy in one’s life. These include reading Scripture, frequently attending the sacraments and looking to the cloud of witnesses, or the saints, for support. If we keep ourselves grounded in Scripture, the sacraments and the saints we won’t let anybody steal our joy or peace, Renshaw suggested. Following her talk Renshaw signed copies of her laugh-out-loud book, “Death by Minivan,” which was published by Our Sunday Visitor last fall. Women waited in line for over half an hour to meet Renshaw and have their books personalized. Learn more about Heather Anderson Renshaw at www.RealCatholicMom.com or on Twitter and Instagram @RealCatholicMom.